More than 900 participants from 10 states within the peninsula participated in the inaugural Rangers 7s Rugby Tournament. The gathering of 72 teams for Boys Under-12 and Under-10, as well as Girls Under-12 saw a majority of grassroots rugby clubs test their mettle over the two-day tournament to help them hone their players’ skills for the rest of the year. 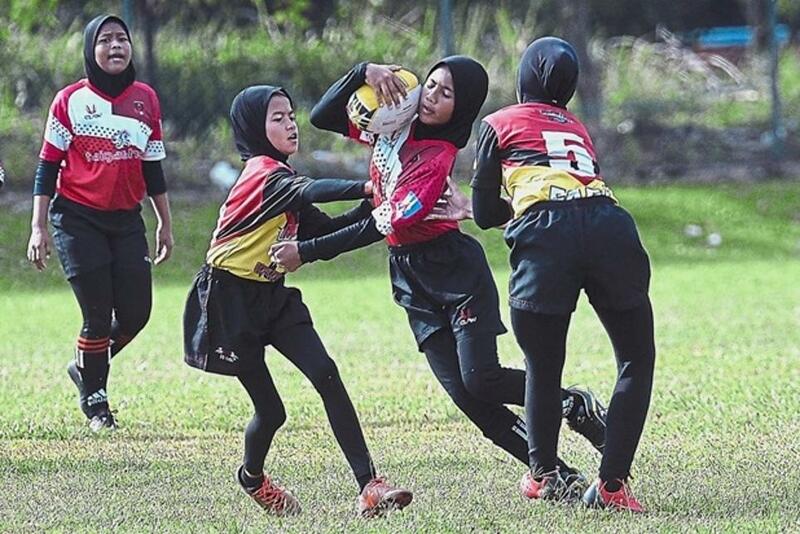 While most rugby tournaments focus on teenage development, here, players as young as six could be seen putting their best foot forward in matches which were played in lesser contact variations of rugby like Rimau and Touch. Negri Sembilan’s Lavender RC of SK Lavender Heights lived up to its billing as the favourites after taking both the Boy’s Under-12 and Under-10 Cup titles. They emerged victorious in the Under-12 after beating Johor’s Spartan Kulai 15-10 in the Cup final, capitalising on luck after winning a coin-toss in the semi-final against Kelantan’s Kota Bharu RA to break the 5-5 tie. Lavender RC captured the Under-10 title a day earlier after a one-sided 12-0 win against SK Kampung Bahagia Dolphins from Teluk Intan, Perak. The Under-12 Girls match saw Kota Bharu RA carve its name out in the age group after edging Negri Sembilan’s Monsters RC 1-0 in the cup final. Rangers Rugby Club president Ahmad Dzia-Ul-Haq Mohamad Japeri said the tournament was first and foremost an avenue for the young players to play rugby while exposing them to matches in a structured manner like a proper competition. “We included a category for the Under-12 Girls this time because we are also hoping to develop them for future school-level tournaments and right now we are trying to promote this category to the Education Ministry. “We received good feedback from other teams and we are very pleased with that. We hope to be able to continue hosting the tournament for years to come,” he said. Hundreds of enthusiastic parents turned up with their children to show support, making the already boisterous event even livelier. A parent Razif Halim, who is also part of the organising committee, said the tournament would not have been possible without the commitment and passion of parents and school teachers. “It is all for the love of the children and the love of rugby. We are lucky to have parents who are generous and supportive towards the cause. “It started off as a group of just parents but as we enjoyed some success in district level tournaments, it became something bigger and now it is a big community effort by parents for their children with help from volunteer teachers,” he said. Thanks to the experience gained from past tournaments and the teachers’ assistance, the two-day tournament organised by the volunteer parents went smoothly. Former national player who is now Selangor Rugby Union president and Malaysia Rugby Union (MRU) vice-president, Raimi Mohd Yusof, praised the Rangers for its initiative. “It is great to see so many teams in such a well managed competition. It is a big feat for a first-time organiser to handle 72 teams. “What I see here is a great prospect for the future of rugby,” he said. He said that academies, schools and clubs were the key to the development of the sport, and teachers play an important role in bringing both sides together. “In the MRU, we are trying to empower more of them to be able to teach students how to play rugby,” said Raimi, who is development head and in charge of the “Get Into Rugby” grassroots development programme by the World Rugby Union.